Mito City, just one hour outside of Tokyo is a treasure trove of natural beauty. From the plum trees of Kairakuen Garden, to the maple trees of Momijidani Park, there is something beautiful to take in whatever the season. Kairakuen Garden is one of the 3 most famous gardens in Japan. Over 3,000 plum trees are planted on the grounds. During the spring, the trees burst into bloom and visitors from all across Japan gather to view their incredible display. 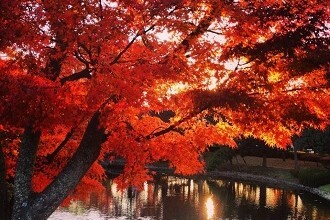 In the fall, Momijidani Park is a popular place to visit to view the bright red maple leaves that carpet the ground, rivers and lake. For adventurous eaters, Mito is most famous for “natto,” or fermented soy beans. While the smell and texture of natto isn’t for everyone, it is commonly eaten at breakfast and served with soy sauce, spicy mustard, and scallions. Natto is also very healthy, since it’s rich in Vitamin K, Calcium, Iron, and Vitamin C. It can also help you have beautiful skin. If the smell or texture of natto isn’t for you, you can try scrambling it with some eggs to enjoy its benefits in a more palatable form.